The holiday season begins early in the Bray household with the family celebration of Gotchya Day―the day we first met our daughter twelve years ago in China―followed by her birthday two days later. Isabel, named Jia Jie at the time, was just about a year old when she was placed in our arms. Those first moments together were full of excitement and fear. We were seventeen American families together, all placed in a room at some government offices in Nanning, finally about to receive the most precious gifts of our lives. I remember our group leader warning us to expect tears as we whisked our new daughters away from everything they knew. I remember how worried our son Clark was about the babies. Only nine at the time, he couldn’t bear to think of them sad. I remember holding my husband’s hand as we spotted her across the room in a yellow jacket with a Peter Pan collar. She smiled at us as if she knew who we were already. The tears came, as did her fear of being anywhere else but in my arms for our first few days together. We were grateful though, because the tears meant she could tell us what she was going through. Her gaining a family meant losing a country and a history. We’ve come so far from that day. There are no more tears, rather Isabel is a tall, slender brown-haired beauty so confident in herself that on the rare occasions she asks for our help―with math from her father or in setting up her computer from me―we are grateful to be able to help in any way we can. Al and I are grateful to parent two remarkable people, happy to celebrate our family and both our children every day. Any celebration requires special foods. This time of year I seek recipes that can be made in large quantities to have on hand when company drops by or as part of a holiday meal. 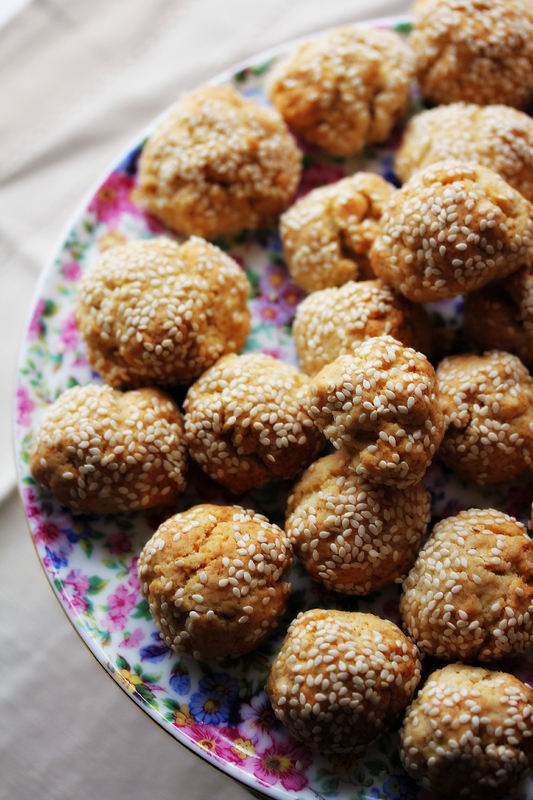 These Italian Sesame Cookie Bites are delicate balls of flavor. Not overly sweet, they are perfect with a cup of espresso and a good book or for dessert with some gelato. They freeze well and are small enough to enjoy a few at a time. Consider doubling the recipe and freezing some for later. Cream the butter and sugar until soft and creamy. Add the lemon extract and egg. Beat to combine. Mix in the flour, baking powder, lemon zest and 2 teaspoons sea salt. Place the sesame seeds and the remaining 1 teaspoon of sea salt on a small plate. Form the dough into 32 small balls and roll them until they are smooth. Toss the balls one at a time into the sesame seeds, pressing lightly on all sides. Place them on a large plate and cover tightly with plastic wrap. Chill in the refrigerator for at least 2 hours or up to 24 hours. When ready to bake, preheat oven to 350 degrees F. Line a cookie sheet with parchment paper. Place the sesame coated dough balls on the prepared cookie sheet, distributing them evenly. Bake them for 25 to 30 minutes, or until the are golden all over. This recipe was adapted from Tate’s Bake Shop Cookbook by Kathleen King. To dress these cookies up a bit consider using black sesame seeds instead of white. To make an almond variation, substitute almond extract for lemon and chopped almonds for the sesame seeds. Consider serving cookies with coffee or tea along with fresh fruit or gelato for dessert. Or, consider making them a part of a cookie platter that includes Chocolate Chip Macaroons, Delicate Oatmeal Shorties and Dark Chocolate Krispy Brownies.